In 1979 Joe Martin began his career as a syndicated cartoonist with the debut of TUCKER, a comic strip about a guy running an employment agency, echoing Martin's own beginnings. 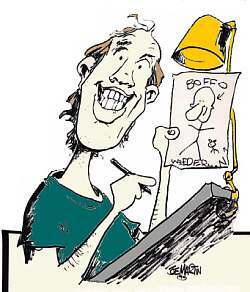 In 2000 the Guinness Book of World Records recognized Martin as the World's Most Prolific Cartoonist, attesting to the fact that since 1979 Martin has been a very busy man, responsible for writing and drawing three comic strips simultaneously, MISTER BOFFO, WILLY 'N ETHEL, and CATS WITH HANDS, totaling 1300 jokes yearly and over 22,000 published since 1978. Everyone knows "laughter is the best medicine", and Martin's latest endeavor, ON THE EDGE , follows that prescription. In this self-help feature Mr. Boffo supplies the laughs and Dr. Jon Carlson, an expert in his field, supplies the guidance and advice. In his practice, Dr. Carlson has found that the cartoons allow people to see their lives and problems differently, thereby having the potential to be an effective method of therapy. In CATS WITH HANDS, Martin poses the question, What would the world be like if cats really had hands, would they need us at all? In this parallel universe of feline control, cats are king, almost. Not content with merely giving them hands though, Martin, in a sadistic twist, morphed mice as the felines' intellectual superiors. The balance of power in this cat-and- mouse game has been weighted to deliver laughs, for cat, and mouse lovers alike. Martin's most popular strip, MISTER BOFFO, which debuted in 1986, currently appears in more than 200 newspapers worldwide, and in the last TRIBUNE comics survey finished second behind DILBERT. Four MISTER BOFFO compilations have been published to date. WILLY 'N ETHEL, Martin's longest running strip, celebrated its twentieth anniversary in March of 2001. It is currently seen in 75 newspapers nationwide, and is "a consistent favorite with readers, regularly showing up in Top 10 lists wherever it appears." Turnbull & Willoughby published two WILLY 'N ETHEL collections. 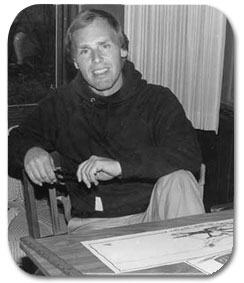 Martin's business panel, PORTERFIELD, which was syndicated from 1984 to 1994, also reflected his background in the corporate environment. In addition to his cartooning career, Martin wrote for the comedy TV series, E/R, which starred Elliott Gould and a very young George Clooney. He also penned HOW TO HANG A SPOON, selling 40,000 copies of the definitive "how-to" book for hanging spoons on your face. As a member of ASCAP, he has written over 300 humorous songs, one of which, MY DREAM OF CHRISTMAS, is heard throughout the Christmas season on radio stations nationwide, including WGN's STEVE AND JOHNNY SHOW, and the DR. DEMENTO program. Martin's Internet site, one of the earliest websites, www.mrboffo.com, and voted one of the top 100 Internet sites, archives strips from CATS WITH HANDS, MISTER BOFFO, WILLY 'N ETHEL, and PORTERFIELD. It also showcases Martin's original oil paintings, one of which was the inspiration for the CATS WITH HANDS strip, while another painting, THE PEEPING TOM, hangs in Yerkes Observatory in Williams Bay, Wisconsin. Martin, father of five, lives in Wisconsin with his wife. Neatly Chiseled Features Art Gallery.